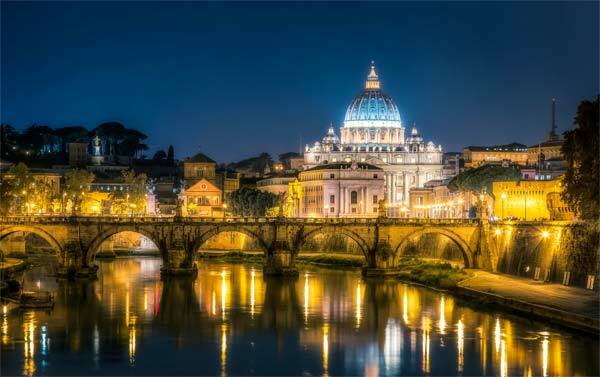 As well as St. Peter’s in the Vatican, there are three other Patriarchal Basilicas; churches under the direct control of the Pope which are Vatican territory, despite being outside the walls. St. John in Lateran (San Giovanni in Laterano) (metro: San Giovanni). Mother Church of all of the Catholic World, this is an important stop for any pilgrim visiting the city. The vast Basilica, first built by Constantine and rebuilt and remodeled several times, owes its interior appearance to the 17th century Baroque architect Francesco Borromini. The heads of Saints Peter and Paul are held above the baldacchino over the altar. As well as the basilica, there is also a splendid cloister, the Scala Santa (the Holy Stairs from the house of Pontius Pilate, said to have been brought back from the Holy Land by Constantine’s mother, Helena), and the baptistery where legendarily Constantine himself was baptized. St. Paul outside the Walls (San Paolo fuori le Mura) (metro: San Paolo). Built over the tomb of St. Paul, the basilica built by Constantine survived the vicissitudes of the Middle Ages only to go up in smoke in 1823 courtesy of a couple of neglectful workmen. The church was rebuilt, and several original features survive. If those aren’t enough, add these three; together with the patriarchal basilicas, they make up the Sette Chiese – the route of every medieval pilgrim worth his salt. San Sebastiano, via Appia Antica (metro: Colli Albani, then bus 660). The 4th century basilica was built over the catacombs which held the remains of Peter and Paul to keep them safe from the persecutions. It was originally named the Basilica Apostolorum, subsequently rededicated to St. Sebastian in the 9th century. The facade and interior date from the remodeling carried out in the early 17th century for Cardinal Scipione Borghese. San Lorenzo fuori le Mura, Piazza del Verano (tram 19, 3). Built over the burial place of St. Lawrence, martyred in the Roman Forum by being barbecued alive, the first church to be built here was established by the Emperor Constantine in the 4th century. Rebuilt in the sixth century, and modified in the 13th, it was massively damaged by an off-target Allied bomb in 1943, and subsequently heavily restored. Santa Croce in Gerusalemme, Piazza Santa Croce in Gerusalemme (metro: San Giovanni) built in a hall of the Sessorian Palace by Constantine’s mother, St. Helena, the 18th century facade belies one of the most ancient churches in the city. Among the relics on display in the crypt, brought back from the Holy Land by the intrepid Helena, are part of the True Cross, and the finger of doubting Thomas. As Christianity became ever more popular in Rome it became necessary to find a system for burial (rather than cremation, commonly used for pagans) of large numbers of people, the majority of whom were without money to pay for elaborate tombs and mausoleums. The solution was found in the friable tufa rock around the city- relatively easy to dig, the stone hardens in contact with air. From the 2nd until the 5th centuries, 60 catacomb complexes (two of which were for Jews) were dug out, each occupying several layers. Of these, five of the Christian complexes are regularly open to the public, run by the Pontifical College of Sacred Archaeology. Catacombs of San Sebastiano, via Appia Antica 136. (metro: Colli Albani, then bus 660 and a short walk). Beneath the Basilica of Saint Sebastian, this complex gives us the name ‘catacomb’ for its position ad kata kymbas, meaning ‘by the hollow’ because of a tufa quarry here. Catacombs of San Callisto, via Appia Antica 78. (metro: Colli Albani, then bus 660 and a short walk). The largest of all of the complexes, with 12 miles of tunnels, was the burial place of nine popes, and St. Cecilia amongst its half a million or so occupants. Catacombs of Sant’Agnese, via Nomentana 349 (bus Express 90 from Termini). The burial place of St. Agnes (her skull was later transferred to Sant’ Agnese in Agone in Piazza Navona) at the complex of St. Agnes and St. Constance on the Nomentana. Catacombs of Priscilla, via Salaria 430 (bus 310 from Termini). This small two-story complex dates from the second century. 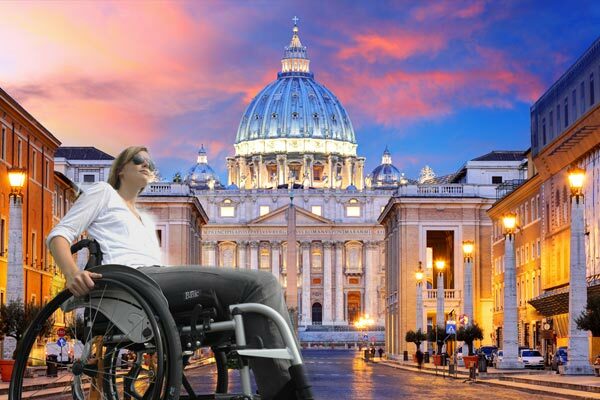 Rome has over 900 churches, and even we haven’t been to them all! In no particular order, here are a few of our favorites. Santi Cosma e Damiano, via dei Fori Imperiali. In part built into the temple of the Divine Romulus, in part into Vespasian’s Forum of Peace, despite heavy remodeling in the 1600's, the apse has retained a fantastic 6th century mosaic. Santa Prassede, near Santa Maria Maggiore. The apse and side chapel of San Zeno have some of the finest church mosaics in Rome, from the early 9th century. Santa Maria in Trastevere, Piazza Santa Maria in Trastevere. 12th and 13th century apse mosaics, 3rd century “recycled” columns, and a 17th century ceiling; Rome wasn’t built in a day, and nor was Santa Maria in Trastevere. Santa Cecilia in Trastevere, Piazza Santa Cecilia in Trastevere. An oasis of calm and a tinkling fountain awaits you in the picturesque courtyard of the church built over the home of St. Cecilia. Inside are beautiful 9th century mosaics, and a sculpture of the body of poor St. Cecilia herself is beneath the altar. Saint John in Lateran (San Giovanni in Laterano) (Metro: San Giovanni) Dedicated to John the Baptist and John the Evangelist, the Basilica of St. John Lateran is the first among the four major basilicas of Rome. The two-storied portico that makes up the facade dates back to the 18th century and the central bronze doors are Roman originals from the Curia (Senate House) in the Imperial Forum. San Pietro in Vincoli (St. Peter in Chains) (Metro: Cavour) Built by Eudoxia, wife of Emperor Valentian III, to honor the chains which held Peter when he was imprisoned both in the Holy Land and in Rome at the Mamertine Prison, and which had miraculously fused together. Also here is the tomb of Pope Julius II, with the central sculpture of Moses, by Michelangelo. Santa Costanza, via Nomentana 349 (90 express from Termini). Just outside the ancient city walls and part of the complex of Sant’Agnese (which includes the ruined Constantinian Basilica of St. Agnes, the 7th century “new” church, and a visitable catacomb complex), the exquisite 4th century Mausoleum of Constantine’s daughter Constantina has some beautiful original mosaics. There is also a plaster cast of Constantina’s tomb (the original is in the Vatican Museums). San Pietro in Montorio, via Garibaldi (Gianicolo). In the courtyard next to San Pietro in Montorio, on the Janiculum Hill above Trastevere, the great High Renaissance architect Donato Bramante built the Tempietto at the beginning of the 1500's on what was once believed to be the spot of Peter’s crucifixion. Long admired for its understanding of the rules of classical architecture, it is considered the first building of the High Renaissance. Ss Quattro Coronati, Via Ss Quattro (Metro: Colosseo). First built in the 4th century, the church is dedicated to the Four Crowned Saints, thought to have been four martyrs who refused to worship Roman gods. After the Normans destroyed the church, it was rebuilt as a fortified monastery. In the thirteenth century, the Oratory of St. Sylvester was frescoed. To see the paintings ring the bell on your right just before entering the church and place a euro or two in the revolving hatch (once intended for babies who were to be left to the care of the convent) and the closed order of Augustine nuns who still occupy the convent will let you in. The frescoes depict the legend of Saint Sylvester, Pope during the reign of Constantine who is said to have converted the Emperor after curing him from leprosy. The submission of the Emperor to the Pope is a direct allusion to the troubled relations between the papacy and Holy Roman Emperor Frederick II in the 13th century. Santa Maria sopra Minerva (Pantheon). Built over an ancient temple to Minerva, Santa Maria contains countless gems (including the remains of St. Catherine of Siena, the tombs of two Medici Popes, and a sculpture of the Risen Christ by Michelangelo). 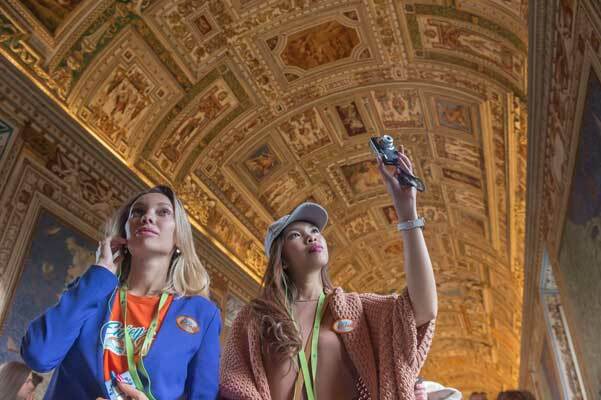 Our favorite though is the Carafa Chapel, in the right transept with late 15th century frescoes of breathtaking beauty by the fabulous Fra Filippo Lippi. San Clemente (Metro: Colosseo). San Clemente’s main claim to fame is its three levels built one on top of the other. The lowest level was once a Mithraeum (a temple to a mysterious all-male ancient religion which involved the sacrifice of bulls), the middle level (the lower church) is the 4th century church, the upper level the ‘new’ church built in the 12th century, with beautiful apse mosaics. In the upper church, the splendid chapel of St. Catherine of Alexandria (immediately to the right of the entrance from via San Giovanni in Laterano) is a glorious work by the Florentine painter Masaccio, before his untimely death. Just as the spirituality of the 17th century focused on apparitions, miracles and the unexplainable, so its decoration refused to be contained by such banal and earthly conceits as stone and plaster. If the art of the Renaissance is coolly, logically, and mathematically held within earthly boundaries, the art of the Baroque goes over the edges; overwhelming the man-made with a glorious, divine and inexplicable spirituality. While the model for all ceiling decoration (Michelangelo’s work at the Sistine Chapel) kept its scenes nicely and rationally, contained within the illusionistic framework he created, the art of the Baroque in the following century, burst out beyond such arbitrary boundaries giving us some extraordinary and theatrical ceiling decorations. The Gesù, Piazza del Gesù (nr Piazza Venezia).This vast church was built as the primary Church of the Jesuit order during the Counter Reformation, when austerity was the key to beating the troublesome Protestants. Given a major redecoration the following century when Rome was altogether more positive, and art altogether more extravagant, the ceiling was painted by Baroque star, Il Baciccio. The vault shows the Triumph of the Name of Jesus. Sant’Ignazio, Piazza Sant’Ignazio. The second church of the Jesuits, the ceiling of St. Ignatius is the great masterpiece of Andrea Pozzo. Unable to build a dome because of building restrictions, Pozzo resolved the problem by painting an illusionistic one. This trick of the eye is best viewed from the circular marker part way down the nave. The main ceiling decoration shows St. Ignatius deflecting the light of God, and spreading the Word to the personifications of the continents. San Carlo alle Quattro Fontane, junction of via delle Quattro Fontane and via del Quirinale. The only project by troubled Baroque genius Francesco Borromini to be fully completed, San Carlino (as it’s known for its diminutive size) is an exhilarating mass of rolling curves which soar heavenwards in a complex design that contradicts the simplicity of the stucco decoration. Sant’Andrea al Quirinale, via del Quirinale. Borromini’s great rival Gian Lorenzo Bernini built this small oval church for the Jesuits and considered it the most perfect work of his career. The church’s plan turns the oval so that the entrance and the altar are opposite each other on the short axis. Over the entrance doorway a semi circular disc appears to have swung down to provide the entrance portico. Above the altar, a stucco sculpture of St. Andrew by Bernini’s follower, Antonio Raggi, shows the martyr ascending towards heaven. The pediment over the altar has obligingly curved back to let him pass from the solid dark earthly level, into the glittering light and gilded decoration of the dome, representing the heavenly realm. Santa Maria della Vittoria, Largo Santa Susanna (Metro: Repubblica). In the left transept Bernini, the undisputed star of the Roman Baroque, created a splendidly theatrical funerary chapel for the Venetian Cornaro family. Members of the family sit in opera boxes carved in relief on either side, looking towards their communal vision of the figure of St. Teresa of Avilà; thrown into ecstasy by a vision of an angel who plunged a burning arrow into her heart, she is illuminated by a hidden window and surrounded by a mass of gilded stucco. 2010 is the 400th anniversary of the death of one of the great figures in Italian art. Born near Milan in 1571, Michelangelo Merisi da Caravaggio spent a turbulent time in Rome working for various patrons before he was forced to flee the city, wanted on charges of murder. If you’d like to find out more about Caravaggio, take Enjoy Rome’s private tour based around the great man or fit together the stories and some of the paintings of Caravaggio with an aperitif or two in Enjoy Rome’s Food and Wine Tour. Follow the Caravaggio trail: Here are the twenty of Caravaggio’s paintings which are regularly open to the public, with their permanent locations. Galleria Borghese: The Galleria Borghese has six of Caravaggio’s paintings in its collection – St. Jerome in his study, the Madonna of the Palafrenieri, David with the head of Goliath, Self-portrait as the Sick Bacchus, Boy with a Basket of Fruit, and St. John the Baptist. Palazzo Doria Pamphilj: The Rest on the Flight into Egypt, The Penitent Magdalene. Capitoline Museums (Pinacoteca): The Gypsy Fortune Teller, St. John the Baptist. Palazzo Corsini: St. John the Baptist. San Luigi dei Francesi: Calling of St. Matthew, St. Matthew and the Angel, the Martyrdom of St. Matthew. Santa Maria del Popolo: the Martyrdom of St. Peter, the Conversion of St. Paul. Sant’Agostino: the Madonna of Loreto.